In December, 2000, I replaced my MKII's springs with Eibach's Pro Kit progressive springs, and the stock struts with Tokico Illumina 5-way adjustable strut cartridges. I relied heavily on the BGB and other owners' "help sheets" to accomplish this. The resulting procedure should help anyone else contemplating this installation for the first time. Keep in mind that it's aimed towards the first-timer. This is a major undertaking, at least in time required, but not an overly complex one. The BGB is of limited help, because several significant tips are missing, and because the BGB tends to be very narrowly focused. However, for torque settings it proved helpful, if occasionally erroneous. Hopefully, the photos will assist in areas where text fails miserably. Some are well-focused, but others are a bit fuzzy. I hope all are helpful. It was a brand new camera at the time, and I am a novice photographer. The images are 1024x768, but I thumbnailed them to help the pages load faster. Clicking on any of them will take you to the full size image. Finally, remember that this is only a guide -- not gospel. What you do to YOUR vehicle is YOUR responsibility. I do not endorse, approve, authorize, or otherwise encourage you to make alterations to your vehicle. Be careful, and recognize the dangers associated with modifications to your vehicle's critical systems, like electrical, engine, brakes, etc. Please contact me if you have comments or suggestions about the article or the project, or if you find errors on these pages. Torque wrench capable of 20-130 ft. lbs. Make sure you know how to use a coil spring compressor, and follow safety guidelines, as these compressors can be deadly. Make sure you have some time to spend. I won't admit to how much time this project took, but there were some problems along the way and I interrupted work to take photos (which requires cleaning your hands each time). I ended up ordering some additional parts from Toyota before I could complete the entire job, but even so this is a full day's job (or more) if you are working alone. Don't rush it! Also, I strongly recommend using 6-point sockets and box wrenches on all nuts and bolts heads. Many of these fasteners will likely not have been removed in a long time, and unless your car has lived its life in a dry climate, rust and corrosion are likely. I started with the rear. Click here to jump ahead to the front wheels. Place wheel chocks in front and back of the front wheels. Loosen the wheel nuts on both wheels, then release the parking brake. I jacked up the car in the center of the rear crossmember. I set jackstands at the jacking points of the door sills. Remove the wheel from one side. On my rear brake rotors, there were ten (10) holes for the wheel studs. Mark one of the holes where the stud protrudes to indicate which ones to line up afterward. I had problems during reinstallation, and changing the orientation of the rotor on the lugs cured it. It's helpful to screw one of the wheel nuts back on to keep the rotor in place. Since the rotor is only held in place by the wheel nuts and the brake caliper, it might tend to fall off later when you remove the caliper. First, remove the U-shaped clip from the underside of the bracket to free the hose joint. You might need a couple of ties to keep it secure and not suspended by the hose. Remove the rotor and set it aside. You'll need to remove the upper mounting bolt on the stabilizing link. I recommend strongly that you soak the nut with penetrating oil prior to the removal. It's quite easy to damage the stud if you don't. Fit a 14mm box wrench on the nut. I recommend a 6-point wrench, but I didn't have one, so I used a 6-point socket to break the nut free. After I'd loosened the nut a tiny bit with the socket, I replaced the socket with a box wrench. It's common for the nut to loosen a bit, then jam up as you try to remove it entirely. If you strip out the internal hole, you can get a grip on the stud from behind the bracket with a pair of thin-nose pliers or vise-grips. Be very careful, though, as I ruined one of the studs this way (more on that later). If the bolt is reluctant to loosen, try removing the lower bolt instead. You can remove the top one later after the strut has been removed. If the stud won't clear the bracket, or if there's too much tension/compression on the link, leave it alone until you are ready to remove the strut later on. Before you proceed to actual strut removal, find a nice, thick towel and fit it between the bottom of the strut and the axle below. This is to prevent (hopefully) any damage to the axle and boot when the strut is unbolted. My rear struts were still under some pressure after the bolts were loosened, although some users have reported otherwise. It's best to be safe. OK, here's a tip that I learned the hard way: take a 19mm deep socket and loosen the nut on the top of the strut rod. Just loosen it enough to make removal easier later on. Now remove the three 14mm nuts that secure the top of the strut tower to the body. OK, now comes the tricky part. You may need to find a way to compress the strut to relieve pressure on the mounting bolts. I used a floor jack, and placed my breaker bar under the stabilizing link bracket on the strut body (since that was the only protuberance I could reach), then jacked it up slightly. This was not a very satisfactory (nor SAFE!) solution, but it worked. Next time, I will find a better brace, like a strong piece of hardwood. If you were unable to remove the upper link stud before, try to remove it as you slowly compress the strut. I strongly encourage you to never put your hand where it could be injured by a sudden slip of the brace. I placed the assembly upright in my vise, and installed the spring compressors. I really liked the way these worked (borrowed from Checker Auto Parts), as they never slipped and felt secure at all times. As you can see, there's only a small rip in the strut boot. This was, by far, the best boot of the bunch. One of them was in shreds. The pipe wrench is gripping the round "collar" directly below the upper suspension mount. If that fails, you'll need to lay the strut on its side and secure the upper suspension mount in the vise. Then you should be able to loosen the strut rod nut. I had to do this with one of the rear struts, but I don't have a photo. Slip the spacer out and put it aside. The Tokicos include a new nut, but not the spacer. OK, ready for disassembly, right? Well, maybe. 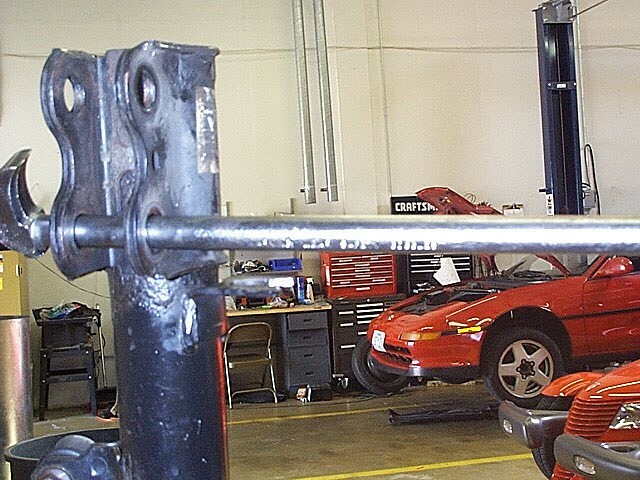 If you are unlucky, the upper suspension mount might have "welded" itself to the strut rod, due to rust, corrosion, bad spirits, impure thoughts, etc. I was lucky with the rear struts, and they came apart once the rod nut was removed. If the upper mount does not pop off, then you'll need to use brute force, persuasion, harsh language, whatever it takes. Trust me, it's simply there by the force of friction. If you wish to know what lengths it takes to remove it, skip ahead to the description of the front strut disassembly I experienced. Once the upper mount was removed, I cleaned it off and sprayed some black paint on it to make it presentable. After all, I was going to see all that rust every time I adjusted the Tokico, right? I set it aside to dry. The next challenge is the large (2") nut that retains the internal strut mechanism. It's often referred to as the gland nut, but I'm not sure where that terminology originates, not whether it's correct. Get a large pipe wrench on the nut and slowly crank it off. Be careful not to gouge the strut body too badly. I had to fit a long steel tube as a handle extender on my pipe wrench to apply enough leverage. Ready for reassembly! Well, maybe after some serious cleaning. We'll skip that part, since it's simply mindless, boring, "fill-your-lungs-with-terrible-solvent-odors" labor. I also took this time to wire-wheel all the nuts and bolts. I even cleaned off the rust that had accumulated on my brake rotor. I live in Las Vegas, so rust is not a big problem (with average humidity less than 10%), but the car came from the Midwest, so there's some history there. In my case, this was an excellent time to take a much needed break. Thai food, anyone? You'll need to add some lightweight oil between the strut cartridge and the strut housing to improve heat transfer. It doesn't take much, and Tokico recommends filling to within 1-1/2" to 2" of the top of the housing tube. I used some 15W motorcycle fork oil I had laying around, since it was available. Fork oil is a bit pricey for this duty, but I knew I'd never use it, since 15W results in really stiff fork action in a motorcycle. Tokico provides a new gland nut (I guess they know how badly a pipe wrench can chew up the old one). They also recommend both a torque setting (~90 ft. lbs.) and a minimum "spacing" that describes the amount of threads showing. If this spacing is below the minimum, Tokico includes a spacer washer that should be inserted atop the cartridge before the gland nut is installed. It was not necessary in my case. I did not have a way of accurately measuring the torque of the gland nut. However, knowing the torque required on the wheel nuts (76 ft. lbs.) and the strut mounts (127 ft. lbs. ), I used my best estimation. Somewhere between "tight" and "God-awful tight". The muscles in my now-aching back are testament to the application of the required force. Once the gland nut is secured, the new strut boot is installed. I used KYB boots, but not for any particular reason other than availability. UPDATE (02-20-01): KYB ships wire ties with the boot to retain it to the strut body. I found that these ties are too weak to hold the boot at full extension, so I replaced them with a heavier tie. If that still comes loose, I think I'll use stainless steel screw clamps instead. Next, I installed the new spring. The top of the spring has a flat top and tighter coils (thanks for that advice goes to the MR2 list!). This was really hard, and another break was called for (to ease my back muscles). Once the spring was in place, the newly painted (and not-quite-dry) upper suspension mount was installed. Luckily, the nut on the strut rod (don't forget the collar!) required a much lower application of torque application. Reinstallation was simple with the exception of compressing the strut to install it into the hub carrier. 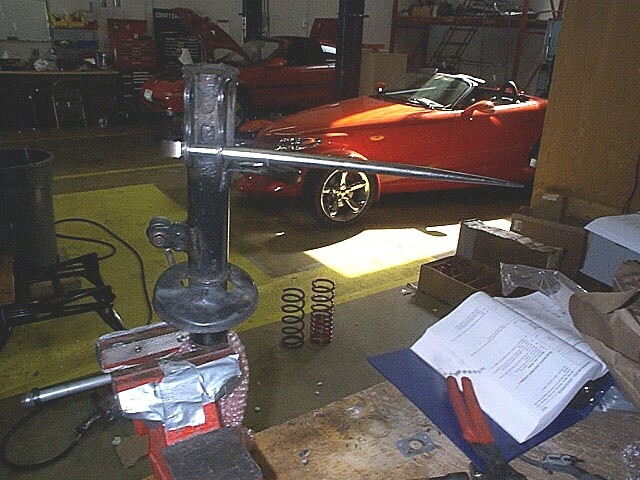 During the removal, the strut is in the proper position, and compressing it is merely to take it apart. During assembly, you need to compress it, then position it, and without the proper tools, it can be frustrating. There's really not enough room to fit spring compressors, so I ended up using the same "mickey-mouse" tools I used to remove it. Next time, I'll find a better brace to use for compressing the strut in place. A special note on installing the three nuts on the studs at the top of the strut. The BGB calls for 59 ft. lbs. on these 14mm nuts, which seems way too high. I tightened them at a little over 40 ft. lbs. One of the MR2 list readers said that in Volume One of the BGB, a different torque is given: 47 ft. lbs. Given that the front struts call for only 36 ft. lbs., even the lower value seems more than adequate. With the rears reinstalled, it was time to do the fronts.